Mister Rogers arrives with a plastic sifter to use at the sand table. After sifting some sand and running water through the sifter, Mister Rogers shares an fun animated film about rain and sand. Mr. McFeely stops by to deliver a new angel fish for the fish tank and invites Mister Rogers to his house to visit with his grandchildren. At the McFeelys' house, Mrs. McFeely and Terri Thompson put clothes on a doll before Chrissy Thompson arrives with her mother. Mrs. McFeely and her granddaughters work together to make lunch for Mr. McFeely. Returning to his house, Mister Rogers shows the shower in his bathroom and talks about how a shower celebration where people give gifts is much different. In the Neighborhood of Make-Believe, Lady Elaine Fairchilde is showered with gifts by many of her Neighborhood friends. Joey Hollingsworth adds to the celebration by dancing. 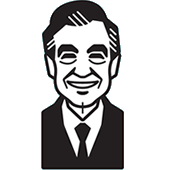 Back at the house, Mister Rogers continues talking about the party kind of shower before he sings You Can Never Go Down the Drain. As the camera zooms out during the scene with the Thompsons, a crew member with a microphone is caught in the lower right corner of the screen.